Thanks for your interest in having me speak. The details and links on this page are essential to getting the most out of a talk from me, and they’re an integral part of my speaking agreement. There are four posts [here] that set the stage and are part of this rider. Over the last thirty years, I’ve given more than 1000 presentations to groups as small as six and as large as 122,000. During that time, I’ve figured out what works and what doesn’t. I’ve also discovered that more than half the time, the technical team on site had no idea whatsoever what was needed for me to do my best work. Hence this handy note..
Seth uses a MacBook Pro laptop running Keynote software. He has his own computer and his own VGA adapter, so a standard VGA cable works just fine. He also has a standard Apple DVI adapter. And HDMI output on his Mac. HDMI seems to be the standard now, let’s go with that. His presentation does not run on any other computer but his. No sound out required. AC power should be within six feet of the computer. Seth needs a wireless lavalier microphone. To be specific, a clip-on tie microphone, not an earpiece. The microphone connects via a belt pack. He’s not able to do a good job with a wired microphone, a handheld microphone or a podium microphone. He also travels with his own Countryman-style mic if you’d prefer that, please ask first. For any group more than 25 people, he needs a microphone. Please be sure that you’ve tested it on all areas of the stage for volume and for feedback. Some large audiences are best served using iMag, which projects an image of the speaker on several large screens. This works well, however, you MUST have your iMag set up so that least one screen the audience sees carries nothing but Seth’s slides, while one or more carry the image of Seth speaking. To be specific, this means that if you have a large group, you should have at least two screens, and at least one of the screens should have just the slides from Seth’s computer and at least one of the screens should have Seth’s image. It is NOT acceptable to switch back and forth on one screen. You’re just going to have to trust us on this—Seth has literally hundreds of slides that he clicks through (pictures, not words) and despite the assertions and promises of those that have meant well, you just don’t have enough time to practice this and get it right. So please guarantee that the screens will be set up as described. The alternative is no slides. No slides is fine with Seth, but switching is not. Seth’s laptop is controlled by a remote control that he brings with him. The laptop must be set up within sight and no more than 20 feet of the most distant point where Seth will be standing. It usually works best to have it on a cocktail table so it can also work as a confidence monitor. Alas, Seth can’t present his laptop to you the night before for setup and safekeeping, nor can he surrender it you the day of the event, except at the final tech check just before his session. However, Seth is more than willing to work with your team on a tech check, preferably at least thirty minutes before he goes on stage. TIP: In groups of more than fifty, Q&A is tempting but not usually an effective way to end the presentation. Instead, Seth recommends asking selected audience members to submit questions to a moderator in advance. Then, when the talk is over, you can have one person firing questions—ending the meeting on an up, not with, “okay, so there’s no more questions, time to go.” The other alternative is a great deal of Q&A, at least fifteen minutes. TIP: Groups that schedule a break right after Seth’s presentation are usually glad they did. You get that high-energy scrum at the front of the room for people who want to say “hi” and you get conversation time as people consider what they just learned. If your booking involves an overnight stay, please be sure to find a hotel that’s either at the venue or closer to the airport than the venue itself, and book a non-smoking room. TIP: Whenever possible, make the room at the event too small, not too big. This is often overlooked and it makes a huge difference. It’s also a good idea to dispense with round tables and pack people in together—at least for the speech itself. Feel free to take as many flash photos as you’d like before Seth’s talk, but please, no flash during the presentation. Seth’s slides are not available for download, or for publishing as notes or a handout. In addition, unless you specifically work it out, you don’t have the ability to record and then resell or distribute Seth’s talk. I’m afraid that I’m not able to work on a stage that’s set in the round, with the audience on all sides. While it’s possible that there’s an audience member or a speaker who has noted that this setup has led to better interaction, I’ve never once met one. 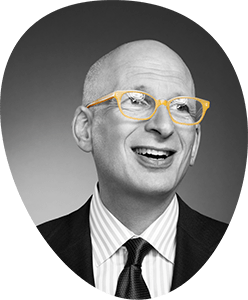 If you’d like to interact with Seth before the event, email is actually quicker and more effective than a conference call. Seth can be reached at seth@sethgodin.com.